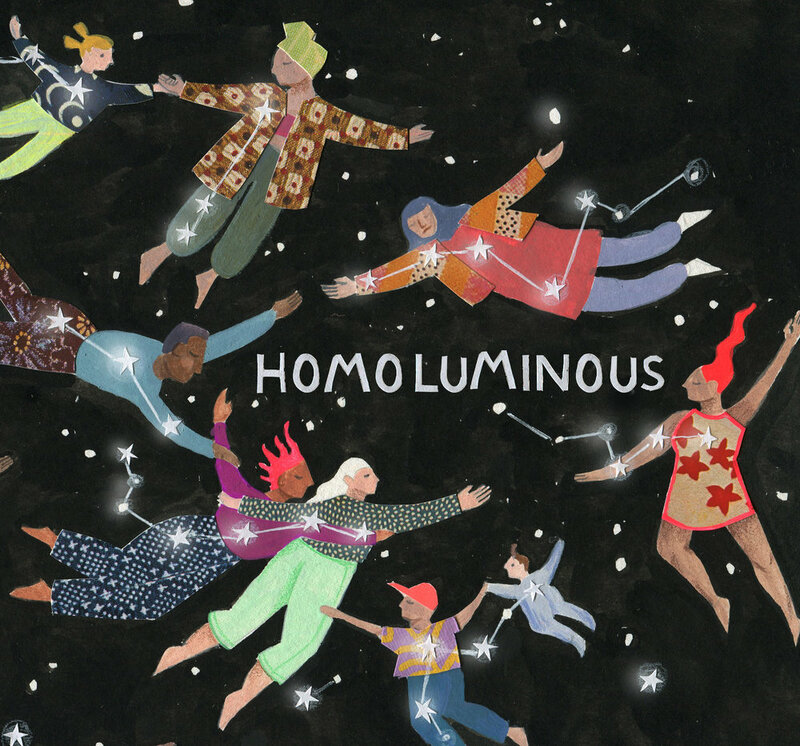 HOMOLUMINOUS 2019 Calendars are in and now shipping internationally. Limited inventory so grab one for yourself today! I had a recent interview with Voyage Chicago. Read more HERE! Hi there dear people! Looking to pick up some goodies in person? Check out my summer fair schedule below! I am excited to announce that I will be releasing a calendar for 2019 annual year! HOMOLUMINOUS will house a new body of work that focuses on the glowing connected beings that we are becoming. The world is constantly evolving, as are we. Through the advancements of technology we are able to communicate with each other instantaneously. Old and new spiritual practices are coming into being as we question our institutions more and look deeply at what there is to celebrate in this world. We are coming up with new ways to live together, new ways to honor ourselves, new ways to fight for our communities, and its changing us. I’ve been playing with the visuals of star filled figures for many years now and only recently have come to articulate what these images mean to me, that we are in fact an evolving species; Homoluminous. We are a new type of human coming into being, one that is more powerful and connected and full of light. This calendar will be a space to explore these concepty; our collective design, are unique talents, our larger trajectory of healing this world and doing it together. This last year I was delighted to be selected as one of the Hudson Valley Seeds Co Art Pack artists! I was paired with the Paul Robeson tomato and was really enjoyed learning about this powerful and talented man. Seed packs are for sale around the country and online HERE. Hi all Chicago area folks! I will be opening up my apartment/ working space to visitors this Sunday from 3-6pm! I will have a lot of things on clearance that I don't sell elsewhere including cards, some misprinted items, and original work! I will also have all my other products available for 20% off. I'm located in Rogers Park just south of the Red Line Morse stop. Message me for the my address!! I was delighted to be a part of this uplifting group print show curated by Jay Ryan of The Bird Machine. Check out the show at Rotofugi Gallery till December 31st! One of my fun projects this year is Pattern Thursday! Every week I will be creating a new pattern. Keep up to day on my Instagram and Facebook!